February 2. Only 110 days until race day. Who’s counting? So far life has been all about adjusting. I’ve been blessed with a healthy and easy going, sleep loving baby boy. I continue to squeeze in work during his frequent naps, while nursing has allowed me to sneak away for my weekday 8 mile runs. Training, later nights, and work have definitely left me with a few more yawns than normal, but I’m managing better than most pessimists expected. “Where are the dark circles under your eyes?” (I can’t count the amount of times I heard that) I’ve been posting most of my mileage thus far. Last week rounded out my first 50+ mile week since the 2014 Boston Marathon, while the cold temps and unsure footing have continued to keep me homebound the majority of that mileage. I’ve found company with my 2014 training friend and it’s kept me (and assuming him) accountable for my long runs. I’ve tallied a single 12 and 14 mile run so far and plan to peak around 18. Unlike most plans, I cap my long runs at 18. I’m lucky enough to be “faster,” which means I can spend less time on the road—peaking just over two hours for a long run. The next four weeks are likely to be the hardest. It’s not often you run more miles than degrees Fahrenheit. Certainly February will be filled with plenty of dark, slippery, numb toed steps. The goal right now is survival and to keep fighting. Some runs are harder than others, which is often irrelevant of distance. This past Saturday’s 14 miler felt easier than a measly six the day prior. The mindset for each run has been mixed, too. Some runs feel like a responsibility, while others are desired. This is the hard part of running a marathon. It’s not race day, it’s the cold, dark days and nights where you’re slipping miles in between obligations. For now, I’m grinding this training plan out. I’m waiting for warmer weather and keeping my eye on the finish line. I know everything will feel that much easier in the presence of day light and with a few less layers. I’m focused on reaching that point—a point where training is more fun and less of a chore. I know what’s on the other end of this training plan: a PR and a 2016 trip to Boston. 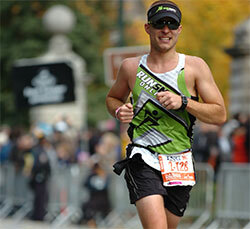 For the first timers out there: don’t think it’s easier because many of us have traveled the 26.2 mile journey. It’s just that—a journey. Use the struggle to fuel your legs on race day. Keep fighting and work the grind… the warmer weather is on the horizon, isn’t it?